Warner Valley near St George Utah is one of the best places to ride in Utah during the winter months when many of the others are too cold or under snow. Even in January we found ourselves riding in just a jersey comfortably. There are a few good camping areas here, one of which is called "Moon Rocks"
Warner valley ride with the kids "cactus loop"
(marked on the map below). 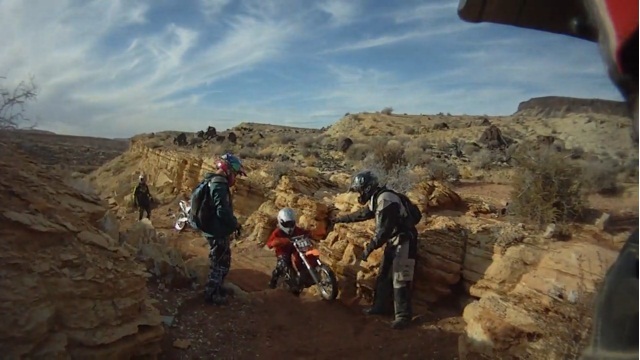 This area is pretty easy to spot because the rocks are more of a grey color than the surrounding reds in the area and there are some hills and rocks to play and ride on nearby. There are a couple other good spots near Moon Rocks as well however and this general area seems to be a good central location for many of the trails. From here you can choose to explore the many washes and trails in the area. They range in difficulty, but most are moderately difficult and can be ridden and enjoyed by many different skilled riders. 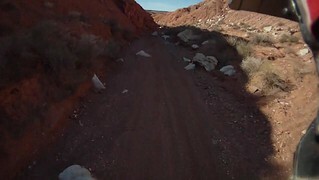 I've outlined 3 loops that we rode that are also included on the video. I'm not sure if they have official names, but one starts near the Fort Pierce ruins so I've referred to it as the Fort Pierce Loop. The "Cactus Loop" was one that a local showed us and was a fun ride as well. The wash they share in the middle is a main route in the area, is easy to find and will take you to some good riding. The "Dino Single Track" Trail is a cool little single track trail near the hill side. It starts near the Dinosaur tracks site(blue marker on the map), so it's been referred to as the dino single track trail. My boys enjoyed all these trails, but needed help occasionally. All of these trails have sections of single track that will stop atv's even though much of it is suitable for them. For more experienced riders, I found it fun and challenging to ride the trails faster. Some of the washes are a blast to ride at a good pace. 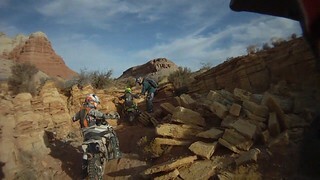 Watch for other riders and rocks however. At the time we went there was a large amount of sand that had drifted over the road that comes in from St George. We were told about this in advance and came from the Hurricane side. We later drove through the sand in our truck without a trailer, but I think a trailer would have anchored us in. Even though this is not a freeride type area in the pure sense, there are numerous washes and trails in the area. The three loops mapped are great rides, but there are many more options here to explore. It's a great area to go and just ride. A GPS is a good idea however if your not familiar with the landmarks and surroundings as you can get turned around quickly following washes etc.